Fancy Tiger Crafts: Holiday Gift Guide! 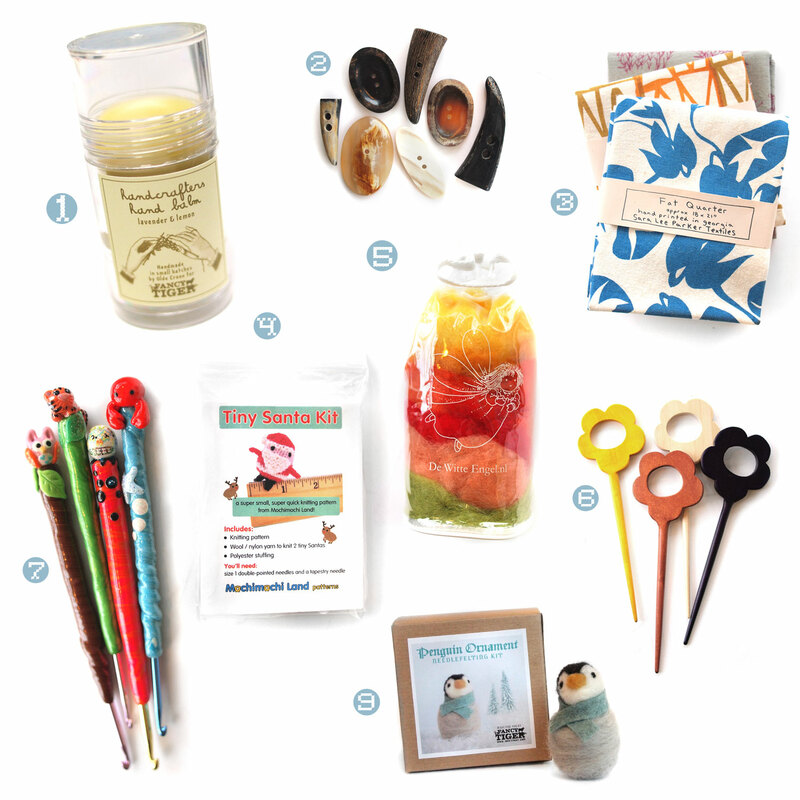 We've searched far and wide to bring you the best gifts for your favorite crafty person! We've got everyone on your list covered with an abundance of amazing, inspiring things. So many amazing gifts under $20! 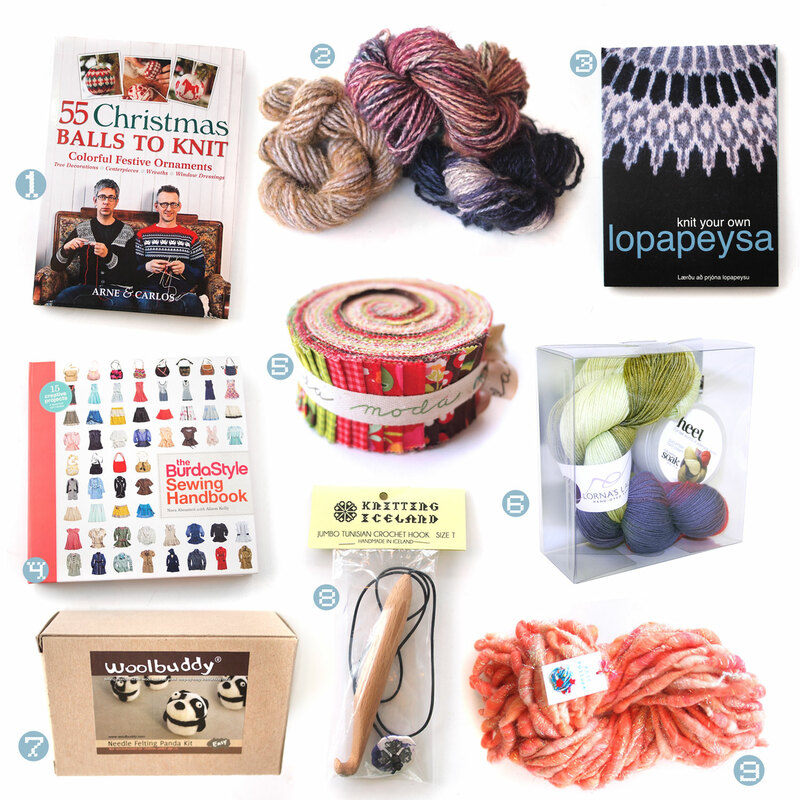 Some more great gifts: 1) 55 Christmas Balls to Knit is full of fun knit colorwork ornaments for the holiday tree! ($24.95) Fiber lovers will swoon over the new handspun, hand-dyed 2) 100% Angora yarn from Malabrigo. That's right...angora from Malabrigo!!! ($22) The 3) Lopapeysa DVD features Icelandic knitter, Ragga Eiríksdóttir, teaching everything you need to know to knit your own Icelandic Lopi sweater. ($30). The new 4) Burda Style Sewing Handbook is a great reference style book that also has amazing patterns - every sewist will want this! ($29.99). An adorable 5) Jelly Roll from Moda is a great gift for the quilter in your life. This is enough fabric to piece together a baby to throw sized quilt and they come in tons of different fabric collections ($35). We are so excited about the 6) Lorna's Laces Solemate Kits. Each kits contains one skein of Lorna's Laces Solemate (the sock yarn with the patented Outlast fiber from NASA to scientifically keep your feet the perfect temperature! ), a jar of Heel Foot Cream, and some Soak wool wash ($40). No one can resist the cuteness of 7) Woolbuddy felting kits! ($24) Enormous 8) Tunisian Crochet Hooks ($40) are handcrafted by our dear friends at Knitting Iceland and are great for working up super quick scarves. 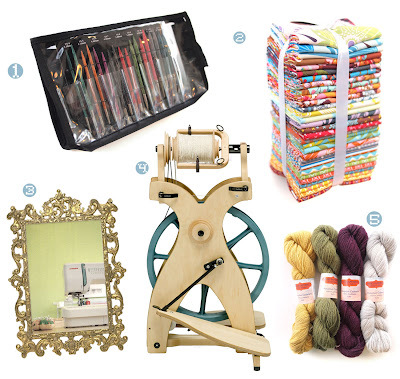 For the crafter at the top of your list, here are some of the most coveted crafty items in all the land: 1) Knitter's Pride Interchangeable needle sets ($86) come with 9 sizes of needles and 4 cords--everything your favorite knitter needs for nearly any project! This year there were so many fabulous fabric collections released and although some of them are long gone, you can still find some of our favorites, like Anna Maria Horner's LouLouThi and Joel Dewberry's Heirloom in 2) fat quarter bundle collections ($56 - $136). Our most popular class series, 3) the Sewing Skills Series ($175) is finally back! This seven week long series is the perfect gift for the beginner sewist who would like to learn some professional techniques to further their sewing skills. The newest addition to Schacht's amazing family of spinning wheel is the 4) Sidekick ($785). It is the most modern and portable wheel we've ever seen and it spins as smooth as a dream. 5) Jade Sapphire 2-ply Cashmere ($49.50) is the most luxurious yarn--perfect for treating the knitter or crocheter in your life who deserves something really special. Check back tomorrow for our super-duper Holiday staff picks and see what all the Fancy Tiger folks are dreaming of this holiday season!